This is me & my brother-in-law’s pug-beagle mix, Boo. Photo by Jason Berg. This was especially true when my second daughter was a baby, and her sister was a busy toddler. I worked part-time as a copywriter at a design firm, and had all the typical household chores to look after. Q was in the midst of potty training (a battle of wills), and was starting to enjoy play dates and other organized activities. But in the midst of the bustle, I could always count on the baby needing to be fed. But she was a baby, of course, and there was only one thing she needed. And always, always, once I succumbed to her need, I felt grateful. Someone needed me, and I had permission to set everything else aside to attend to that need. The best part, was that the need required sitting still, and being completely relaxed. Sometimes I read, but usually I just sat, and enjoyed my baby. I’m not having any more babies, though, so you guessed it—this is where the dog comes in. Before you all really start to worry about me, I know a dog is a dog, not a human being. I realize the dog will eat dog food, and I don’t need to hold it while it does. I also know that getting a dog simply in the hopes of filling some hole in my life is unrealistic and possibly even disastrous. Jason and I have talked extensively about the pros and cons of having a dog in our lives, and there are multiple reasons we’ve decided the decision and time are right (most of them revolving around our middle daughter, the Dog Whisperer). But a couple of weeks ago, as I felt my life spinning slightly out of control around me, with too many deadlines and responsibilities, I realized what I wished for. I wished I had an excuse to just sit, and be calm a few times a day, like when I was breastfeeding. And it suddenly occurred to me how much love and attention dogs need, and how soothing and relaxing it is just to sit and stroke a dog. Even though there will certainly be times when I’d rather not pull myself away from what I’m doing and leave the warm, dry house to walk the dog (just like there were moments when I wished I didn’t have to stop to feed my baby), I know this routine will be good for me. It will feed my soul and stretch my legs, and offer fresh air and time to think. That’s what’s been missing in my life lately, I think, especially now that the girls are getting older and more self-sufficient. I’ve been missing a reason to hit pause on the busyness, and just BE. The past month or so we’ve been looking for the right dog to adopt. That saga is worthy of a whole separate blog post, but we just may have met our match. Last night, Jason and I drove out to Zionsville, Indiana, to meet a seven-month-old pug-beagle mix at the home of her foster family. She’s a sweetheart—calm, docile and easygoing. She settled into my lap as if she would have happily stayed there for hours. Petting her silky ears and neck was like a drug, lulling me into a thick, sweet stupor—one that I just might get to experience in my own living room some day soon. I’ll keep you posted. I agree that a dog is needed, but what is one to do with an allergic kid? Can’t wait to hear about your new pup! And, I forgot to say, you look lovely as ever. You did it! Congratulations! 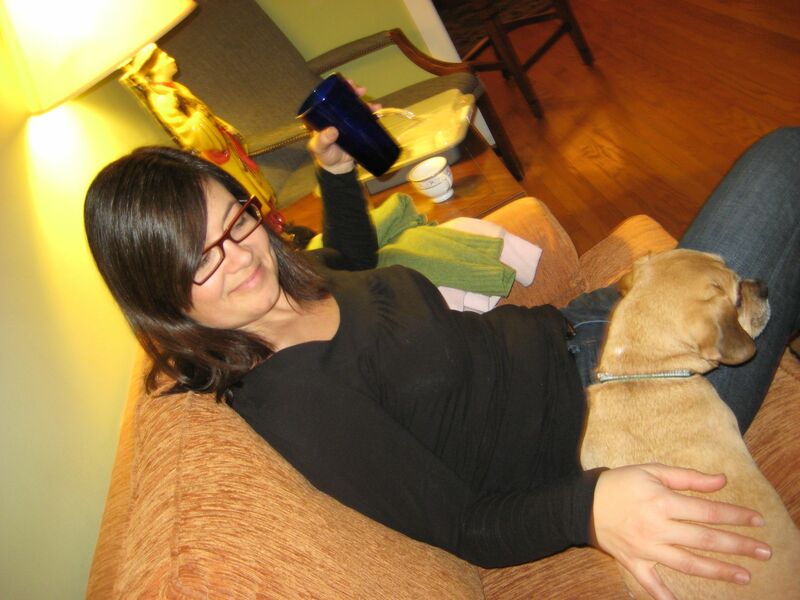 Through reading your blogs, you and your family always struck me as dog people. And, just think, you’ll never have to worry about another rabbit or squirrel hanging out in your yard for too long! Cheers to the love and many laughs and adventures a dog brings to a home. I think I get you 100% here. A dog will be a good compliment for your lifestyle, and a pet is such a stress reliever. Sometimes I wish I could bring Edgar to work, and always I am glad to have a furry little friend to sit on my lap when I get home. ‘petting her like a drug’…. bang on! There was a local news story recently covering the effectiveness of petting dogs to destressing and likened it to ‘prozac’. Enjoy! Cant wait to meet your new family member! Ashley, I love hearing your dog story. You and your husband probably learned a lot about each other through the process of training and caring for your dog. What a valuable experience—one that continues to give back to you each day. Cobalt-Blue, that’s right—you started all of this, didn’t you? :) Well, our kids did, but you are clearly in cahoots with them. As soon as we actually have a dog at home with us I’ll share the news and photos, too! Trina, that whole drug connection is really funny, and interesting, too. Did the article you read say anything about how petting a dog alters your brain chemistry similar to prozac, or was it less scientific than that? As far as allergies go, some people do have success with some of the ‘shed-less’ breeds, just a thought for some out there. Can I just say that you have written exactally what I have been trying to say for months to my husband, ironically a Jason as well. Thank you so much for this post. I will be having him read it tonight.